Going eastbound, Blue and Red Line trains use the left (lower in the diagram) track until the junction, where Blue Line trains continue on and Red Line trains switch onto the track towards the Airport. Coming westbound, Blue Line trains use the right (upper) track and Red Line trains merge onto the eastbound Blue/Red Line track before heading onto the center track. Possible delays because two switches need to be moved (airport extension/eastbound track, eastbound track/crossover to middle track) between a train from the airport and an eastbound one, and trains from the airport must travel in the reverse direction on the eastbound track between them. In addition, service to the airport can’t be operated if the switches become inoperable due to snow/ice or other issues. Connect the airport track directly to the middle one, with a diamond crossing of the eastbound track and separate switches between those two tracks. It would also possibly cut down delays in normal service (no waiting for the two aforementioned switches to move) and allow airport trains to operate as shuttles without interfering with eastbound Blue Line ones or requiring any switches to be moved. In the photo at right, the black section of track (and switches at either end of it) would be removed and the blue sections would be added including switches at the lower and right ends, one at the upper right end and one to connect the two blue segments. Red Line trains to the airport would switch from the eastbound (to Gresham) track as the currently do, ones from the airport would take the blue segment directly to the middle track instead of switching onto and off of the eastbound track. 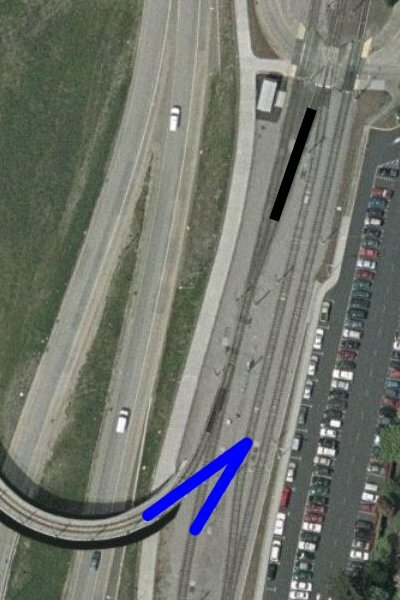 If the current stretch of middle track between the two segments is used to store trains, it appears that there is room to construct a new storage track between it and the left one.